Privacy Masks 32, individually configurable; maximum 8 per Pre-position; programmable with 3, 4 or 5 corners; selectable color of Black, White, or Gray, as well as an “Auto” option in which the camera selects the most prevalent of the three colors (Black, White, or Gray) in the background scene as the Pattern color. Virtual Masks 24 individually configurable Virtual Masks to hide parts of the scene (background motion such as moving trees, pulsating lights, busy roads, etc.) which should not be considered for flow analysis to triggerIntelligent Tracking. Alarm control Rules-based logic supports basic and complex pre-defined user-specified commandsIn its most basic form, a “rule” could define which input(s) should activate which output(s). Washer Pump Interface Control functions integrated. Alarm/Washer Interface Unit (MIC-ALM-WAS-24, sold separately) provides electrical interface to user supplied washer pump device. Camera status monitoring Integrated sensors monitor operational status such as internal temperature, humidity level, incoming voltage level, vibration, and shock events. Diagnostics Various status conditions are tracked in internal diagnostic log. Critical fault conditions will also be displayed on screen. Supported Serial Protocols Bosch OSRD, Pelco D/P, Forward Vision, Cohu. Requires separate eLicense installation. Cloud-based services Time-based or alarm-based JPEG posting to four different accounts. Accounts can address FTP servers or cloud-based storage facilities. Alarm events can be set up to trigger an e-mail or SMS notification. Ruggedized dual thermal/visible PTZ camera. 30x visible zoom. Thermal imager with standard resolution (320x240 pixels), <9 Hz frame rate, and 19 mm lens. Ruggedized dual thermal/visible PTZ camera.30x visible zoom. Thermal imager with high resolution (640x480 pixels), <9 Hz frame rate, and 50 mm lens. 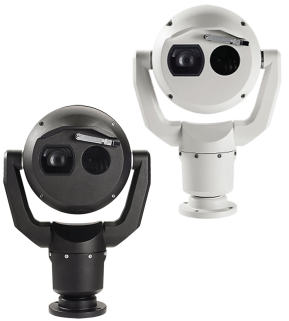 Ruggedized dual thermal/visible PTZ camera. 30x visible zoom. Thermal imager with high resolution (640x480 pixels), 30 Hz frame rate, and 50 mm lens. Sunshield kit for MIC IP fusion 9000i cameras, white color. Recommended for use with white color MIC IP fusion 9000i cameras installed in locations with high sun load. 5-pack weather protection kit for MIC IP fusion 9000i thermal cameras. Provides an IP67-rated barrier against dust or moisture. White color.